This post is supplemental to my video introducing the French Box and looking at it all over, French Box Easel – Full Guided Tour . Here I want to show you some more details and cover some of the issues encountered by beginners. The French Box Easel is a compromise. 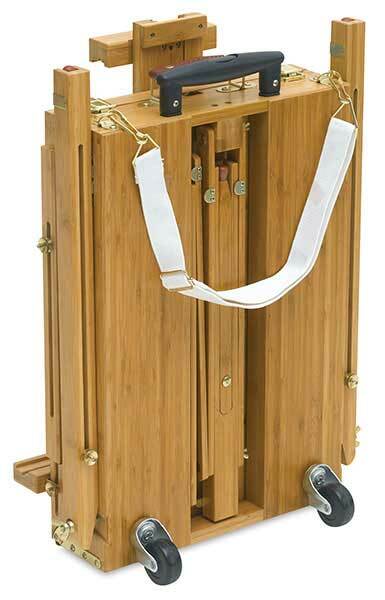 Don’t buy one expecting it to be the strongest and most versatile easel ever invented- it’s not! But, treat it with respect, understand its limitations and use it for its intended purpose and you will get years of valuable service. When you think about those things, the basic design concept is genius because it does all that! However people tend to forget that you can’t have everything in one without some trade-offs. People will buy a perfectly adequate French Box Easel and then complain about things as if they’ve been ripped off just because they don’t understand the facts of life about French Box Easels. The legs along with everything else are made as thin as possible whilst maintaining enough strength to do the job in order to prevent it from being too heavy. It’s primary function is not that of a studio easel where weight is not a factor. It has to be light. Thick timber with the strength of steel reinforced concrete may be strong enough to satisfy some more demanding folk but it would totally defeat the purpose of portability! Yep, they do. Get over it! However, you don’t have to carry a large wrench to tighten the locking nuts or bust your fingers. 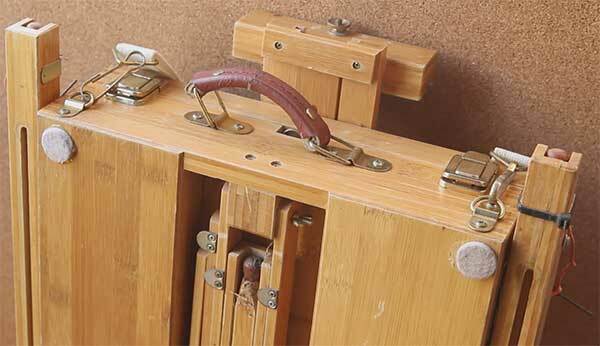 I address this in the video and show my simple solution which is to add locking pins. Other artists replace the default nuts with large wing nuts so they are much easier to tighten by hand. That’s right, it won’t! It’s not steel reinforced, remember? Be careful with it, don’t throw it about or climb up it. Accept that normal wear and tear will occur but that won’t diminish the functionality if you do simple maintenance when required. Plus, a few war wounds give it an air of respectability and street cred with your artist buddies. Mine is just about due for the plein air easel’s equivalent of the Victoria Cross. It’s not for children! Give them something light and more their own size. At the very least, get them a half sized French Box (they’re 50% narrower) made of the lightest woods. Possibly even before you opened the box when new. If you didn’t pay a week’s salary for it and have it specially imported from a highly skilled artisan working carefully by hand in a quaint workshop somewhere in the depths of the French countryside, then it was probably made in China and you got it cheap on-line or paid too much for it (but still got it cheap) in an art store. They’re made to a price and in mass quantities. If a screw is loose, put it back with some glue or put a bigger screw in. If there is a real problem with a new purchase, which can happen with anything, get it replaced on warranty. It has lots of moving parts and is carted about in cars and such, probably over rough roads. Of course things are going to come loose. Anything with moving parts needs regular maintenance to keep it in good condition with everything where it should be. A screwdriver and some glue will do wonders. Yes you can, its an easel like any other easel when set up. They work great indoors. 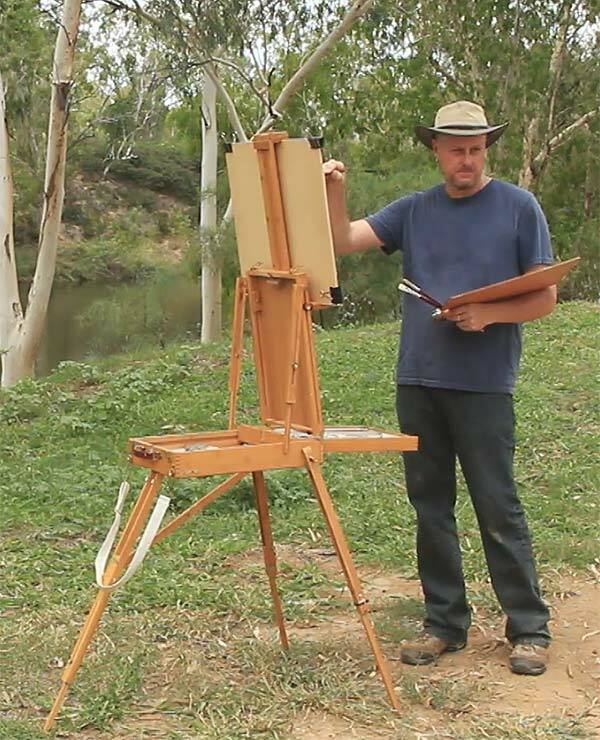 I use mine when teaching and travelling and as a supplementary studio easel. With the legs folded up and clipped in, it makes a perfectly good tabletop easel. And you can get your work surface to all sorts of extreme angles, right down to flat, for those who work in watercolour or drawing etc. Fine then, if you’re going to be like that, get one made from Bamboo. Let me tell you a story. Two years ago, in the middle of the night during a tropical downpour, a large canvas awning attached to the side of my caravan filled up with water and came crashing down, destroying everything beneath it including my Condor Bamboo French Box Easel (yes, the one in the video). It and my portable fold up Mont Marte pine sketch easel (also heavily customised) were set up and being used in my makeshift studio. The falling annexe crushed both of them with their legs and other bits shattered and left soaking in hundreds of litres of muddy water and flapping canvas. This happened before the video was shot so obviously the easel went back together again and works as good as knew. I repaired both of them. Some clamps and Araldite (a strong epoxy glue) did the job. The point of this is that even if they seem flimsy, the bamboo French Box Easels are pretty darn hardy, even after taking a beating. OK, we’re not all body builders. You can buy them with wheels and handles and trundle them about like suitcases if you want. Wheels and handles take up space though so that’s a bit more of a compromise. Alternatively, you can carry them on your back with purpose made harnesses or backpacks. Also, not quite as elegant but still very practical, a simple trolley to carry it is cheap and effective. I Want One! Any Suggestions? Yes and I will address that in another post.